This has to be the ideal choice for a romantic break, set in a dreamy countryside location where you can abandon the four wheels of a car and take to two feet or two wheels to explore this beautiful area. 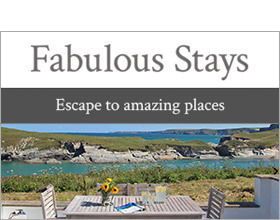 Whether it be for a Valentine's break, a snatched wintery weekend or peaceful summer holiday. This well appointed cottage is one of two eco-friendly, rustic cob and stone barn conversions, the other being Apple Cottage, and is positioned just outside of the pretty village of Colebrooke in the heart of the Devonshire countryside. Newly refurbished to a high standard the cottage uses an Air Source heat pump to provide both water and heating and the owners are keen to promote a green lifestyle providing guests with eco friendly cleaning products to use during their stay. Plum Cottage sits in the grounds of the owner's Farm, surrounded by fields and overlooking a cider orchard. Contemporary splashes of bright colours and sleek modern furnishings have been carefully balanced with the rustic charm of the original building that boasts many character features. The modern interior includes an attractive fitted kitchen, sleek dining set and bright red settees to relax on in front of a wood burning stove, that will ensure your complete comfort in out of season breaks. Stairs lead to a shower room and a spacious bedroom furnished with Kingsize bed and flat screen TV. Glorious views extend over the orchard and outside to the front of the cottage there is an area to relax equipped with garden furniture and parking for one car. The location is perfect for exploring on foot or by bike with the nearest train station at Yeoford just a 15 minute walk. Here you can take The Rail Ale Trail along the Tarka line enjoying some of the most breathtaking countryside following the Yeo and Taw valleys, that run the 39 miles between the Cathedral City of Exeter up towards the North Coast and the historic market town of Barnstable. Join the Two Moors Way just 15 minutes walk from the cottage where you can follow the route that spans from Ivybridge on the south edge of Dartmoor to Lynmouth on the north coast of Exmoor. The lovely golden sands of Exmouth can also be easily reached by train or by car if you yearn for a day on the coast. There are two good pubs in the area one in Yeoford just a 15 minute walk along a footpath and the New Inn at Coleford a very popular dining pub and just 20 minute walk. Over two floors. One king-size double bedroom with TV. Shower room with shower, basin and WC. Open plan living area with kitchen, dining area and sitting area and woodburning stove.